According to some lad on reddit Rojo's contract was discussed on the Transfer Window Podcast at around the 32nd min mark. 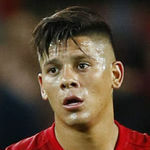 The TDLR version he gave was - "Woodward upgraded his contract in 2017, increased his salary to 160 p/w, Fenerbahce are interested in signing him, but Rojo prefers to stay in England. He was close to moving to Everton last season but they couldn't afford his wages." 160k a week... Shambles if true. Alderweireld and Vertonghen are reportedly combined on 180 p/w. I'm sure there was some cleaner who leaked his wage slip and that 140k a week. The idea that we exchanged Nani, AND gave them a fairly decent fee for this guy has to be right near the top of our worst ever deals. It was 200k and it clearly wasn't a weekly salary. Let's just play this crazy shithouse for the last few games, it'll add something ... I think.